Polished gold-plated stainless steel case in the shape of an "H". 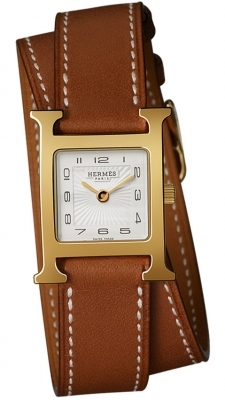 Golden barenia calfskin leather strap with contrasting white stitching and a tang buckle. Black painted Arabic numerals and gold-tone polished hands. Gold-plated case back adorned with the Hermes logo.